The Giordano Libero 1.6 Women’s Road Bike is equipped with a custom made lightweight and strong 6061 aluminium frame. The bi-cycle weighs only 23 pounds. 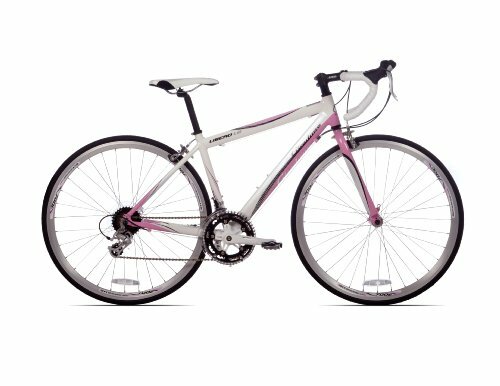 Available at an affordable price, the bike also boasts of a precision Shimano STI (16 speed) equipped drive train, Shimano RD2300 front derailleur, Shimano FDAO50 rear derailleur and 700cc wheels all of which contribute to provide the rider with a unique, thrilling and joyful ride. It offers a complete package of efficiency, performance and durability along with the best features available in this category. For gearing, it uses Shimano STI ST2300 (16 speed) shifters along with integrated brake levers. Alloy Side Pull Front and Rear brakes are available which make the braking smooth. Alloy Prowheel 170 millimetre arms (42/52) crank; VP Catridge Square Taper bottom bracket; Shimano CS HG30 (8 speed) 11-30 ; Vitesse Alloy (700c,32 hole) High V-Profile Silver rims; Black Road Clincher 700×25 tires; Velo Road Steel Rails saddle; Alloy (32 hole ) hubs with front and rear quick release; Alloy Black seatpost (27.2 x 300mm) and Alloy black seatpost clam;VP plastic body pedals with alloy cages are some of the other components that make up the bike. The bike weighs 23 pounds. The Giordano Libero 1.6 Women’s Road bike can be considered as an option if you’re looking for a reliable, easy to ride and affordable bi-cycle. It comes with 6061 Aluminum plus frame which has been designed to keep the bike as light as possible and it does a good job; the bike weighs only 23 pounds. The gears are smooth and the brakes do a good job too. The front and rear derailleurs are tuned out of the box and do not need any tweaking in most of the cases. Although the bike offers a great bargain, you should pay attention to a few things. The brakes might require an adjustment and if you’re a beginner, it is best to pay a visit to the local bike shop to make sure everything is set up. If you have small hands, you might face a bit of difficulty to reach the shifters/brakes. The quality of the seat is not at all good and you might have to change it before you take it to a long trip. The front tire also has a tendency of losing air initially so keep an eye on it. The bike is available in two sizes and following is a rough guide that you can use to pick the one according to your height. It is a pity that the bike is available in one colour only- pink. The quality of the ride is smooth and if you’re a woman and an entry level biker, you can definitely consider this as an option.